A teeth grinding – ‘bruxism’ – treatment is a safe and simple solution to a common problem that causes excessively wide, masculine looking jaw muscles and irreversible wear on teeth. Prevalence of teeth grinding is very common, with many people doing it during sleep, without knowing. Excessive teeth grinding can cause over-development of the masseter (jaw) muscles, making your face appear unattractively wide and square. 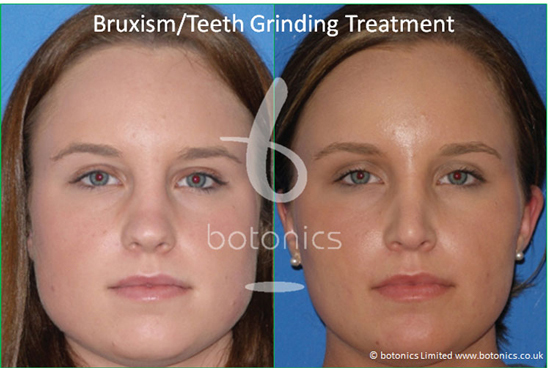 Teeth grinding jaw reduction treatment is available in the UK from botonics at our prestigious Harley Street clinic, in the heart of London’s private medical district. A masseter reduction Botox* treatment is an advanced treatment, and needs to be done by an experienced specialist to reduce the risk of chewing weakness and maximise the results. At botonics, we have developed techniques that produce a reliable and attractive result with minimal discomfort and risks. Jaw reduction treatment with Botox* takes several treatments in order to atrophy (shrink) the masseter muscle. It is popular with clients who feel they have a ‘fat face’ out of proportion to the rest of their face or body. It is also popular with our male-to-female transgender clients to help feminise the jawline. Warn teeth: A sure sign that you grind your teeth is excessive wear on your molars. Ask your dentist at your next check-up if they feel you suffer from bruxism. Wide jaw: The excessive grinding over-develops the masseter (jaw) muscle, resulting in a square, wide jaw. This can have the affect of making you look overweight or have a ‘fat face’. A wide jaw could be a result of bruxism, and can be improved with a Botox* treatment to the masseter muscles. Headaches: People who grind in their sleep often awake with headaches, and/or muscle pain in the jaw, temples and neck. This could be a sign of bruxism, and can be alleviated by Botox* treatment. At your free consultation, the specialist will review your detailed medical history and advise whether a masseter jaw reduction treatment is appropriate for you. Most people are keen to have their treatment as soon as possible but there is never any obligation proceed if you do not wish to. The treatment works by relaxing some of the masseter muscles, which causes them to atrophy (shrink) with time. A course of treatment will take several visits spaced some weeks apart, depending on the severity of your bruxism and affected muscles. We only use the gold-standard Botox* brand from Allergan to ensure the best possible results. A series of small injections will be made to the masseter muscle and the whole visit will take only 30 minutes. It takes several months before the masseter muscles will get visibly smaller, and treatment will need to be maintained over time (although treatment frequency tends reduce with time as the muscles continue to atrophy). We use only brand-name, gold standard Botox* as manufactured and approved for use in the UK. Beware of cut-price treatments that use generic botulinum toxins from India or China. Our treatments are administered by qualified medical specialists who are experienced in Cosmetic Dermatology treatments and legally authorised to prescribe medications to you. Our price for Jaw Reduction treatments start from just £700 for a course of 2 treatments, and you can spread the cost of any treatment over £600 interest free for up to three months. Who is a candidate for Bruxism or Jaw Reduction treatment? If you’re unhappy with worn teeth, headaches and/or a wide jaw, then our Bruxism treatment could be your answer. Contact us to book a free consultation with our Bruxism expert.